By HALEY A. SCHWARTZ, ESQ. Your legacy is not just a collection of your possessions and assets that you leave to others when you die. Your legacy is also, and arguably most importantly, the essence of how you live your life, how you influence others to live their lives, and how you are remembered for what matters most to you. The receipt and gift of life lessons and values can be the most valuable “inheritance” you receive from your loved ones. Each one of us has something to share and intuitively we know the importance of passing on an enduring message. However, there is a deep disconnect between recognizing the importance of expressing one’s message and doing it in a permanent and tangible way. Preparing an Ethical Will provides the solution. An Ethical Will is not a legal document like a Last Will and Testament. It does not direct the disposition of the things that you have to others, rather, it shares with them the thoughts that you want them to know. 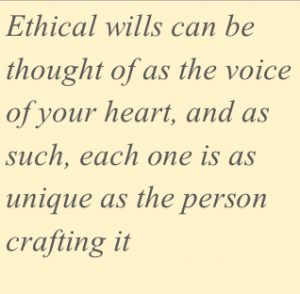 Ethical Wills are deeply personal and can include any number of topics. For example, an Ethical Will can preserve your family heritage, express your hopes and dreams for the future, provide life lessons and rules to live by, emphasize your spiritual values, explain why certain charitable causes are important to you, and perhaps provide an opportunity to ask for forgiveness or to forgive others. Quite simply, it is the voice of your heart and every Ethical Will is as unique as the person crafting it. The product of your Ethical Will is for your intended audience, but the process of preparing it can be just as affecting for you. By articulating your philosophical essence and values you can create your own personal mission statement to live by. You may engage in meaningful self-reflection. Your words could encourage resolution of family conflict. And, you may find that you tap into new ideas or realizations that can impact, change, or strengthen your current relationship with others and/or your community. The tradition of Ethical Wills has roots in the Bible and their form and substance have evolved over time. Central to the enduring practice of preparing an Ethical Will is an intention to bequeath instructive values. Ethical Wills have no rules for construction. Commonly, Ethical Wills are handwritten or typed letters to your family, community, or unborn descendants. However, an Ethical Will can also be a scrapbook of pictures or a box of memorabilia with explanations of each selection. It can be a collection of quotes, recipes, books, or songs that resonate with you and the reasons why. And, it can be a personal sound or a video recording where your voice and/or image is shared along with your message. If you do not express what matters most to you, who will? Leaving a legacy of your words through an Ethical Will may be the most important thing you give to others and to yourself.